While pets are a big part of the family, with the rabies outbreak, pet owners are encouraged to be more careful. Love them or hate them, it is hard to get away from pets. And even if you don’t own one yourself, you are likely to come across them (or things they have left behind) regularly. Most interactions between humans and pets are likely to be overwhelmingly positive. But pets can carry some diseases that affect us. Such diseases, termed zoonoses, are usually very mild, but the rarer ones can be more severe. Rabies is perhaps the archetypal zoonosis. A virus whose name alone has the potential to cause fear. The virus is largely found in unvaccinated dogs and other canine populations. In areas that still have rabies, people – often children – usually become infected when they are bitten by an affected dog. The virus attacks the brain, and once symptoms develop, there is sadly no cure, and those affected die. The good news is, it can be prevented by vaccinating dogs and other wild carnivores. Many parts of the world are now free of the virus, including the UK and large parts of the rest of Europe, and in many others, national campaigns are under way to achieve this. Some zoonotic skin infections are not uncommon in pets but usually mild in humans. These can be shared with owners because of our love for warm houses, and close contact with our pets. Ringworm is one such infection. Ringworm is actually a misnomer. It is not a worm at all but a microscopic fungus, closely related to the cause of athlete’s foot in people. Affected cats, dogs and other animals may show very few signs. However, in its classical form, pets with ringworm usually have circular areas of hair loss. The affected area of skin becomes scaly, flaky and itchy. It is very treatable, but can occasionally cause scarring. 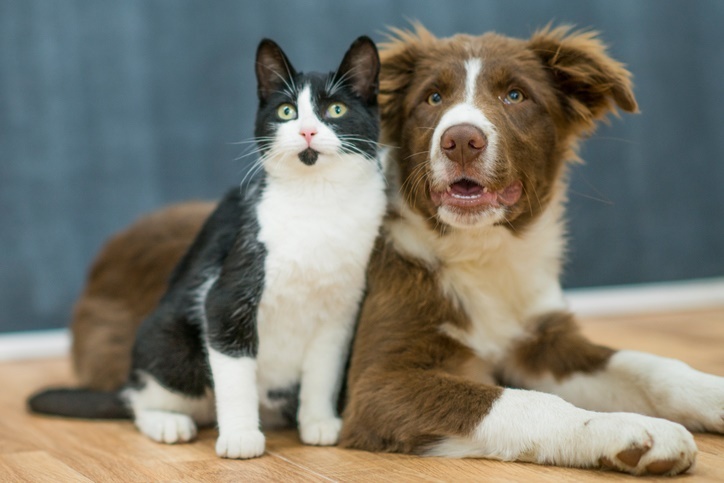 A variety of potentially zoonotic bugs live in the intestines of pets. These rarely affect humans. However, when they do, they can be severe. We have all probably heard of salmonella, largely because of risks, now thankfully much diminished, from eggs. Dogs and cats can also carry salmonella, sometimes causing diarrhoea. Salmonella is also quite commonly present in pet reptiles and amphibians, as well as in so-called “feeder mice” that are fed by some to pet reptiles. It’s always a good idea to wash your hands after handling both pets and raw pet food. It is also a good idea to have separate areas for preparing raw animal food and human food. Toxoplasma is a common parasite in cats that they can also shed in their faeces. For most humans, it is entirely benign. However, if a woman first becomes infected during pregnancy, it can, albeit rarely, have severe complications for the developing foetus. Pregnant women should take simple additional precautions around hand hygiene, avoiding cat litter trays, especially those not cleaned regularly, and avoiding eating uncooked garden produce where cats may have had access to the soil. Some argue for bites and scratches to be included as a zoonosis. If we do include them, they are likely to be among the most common zoonoses. Never nice, always painful, and in disturbing, rare cases – usually involving children – they can be fatal. Cat bites and scratches can transmit a bacterium called Bartonella henselae, the cause of “cat-scratch disease”. Both bites and scratch wounds can become badly infected causing further pain. Scars, both mental and physical, can be lifelong in those that have been attacked. Children and those exposed occupationally, such as postmen, are perhaps most at risk. As with most infections, zoonotic infections have a greater potential to do harm in people whose immune systems are compromised, such as the elderly and those suffering from immunosuppressive diseases (such as HIV/AIDS), or undergoing immunosuppressive therapies (such as chemotherapy). However, even if your immune system is compromised, you can still benefit from owning a pet. And with care and a little knowledge of the risks, you can avoid infections. Thankfully, zoonotic infections are not common. Most infections we get are likely to come from other humans. However, the risks of zoonosis can be minimised by being aware of them and by taking simple hygiene precautions at home. And, if in doubt about the risks, you can always consult your GP or a veterinary surgeon. Alan Radford, Professor of Veterinary Health Informatics, University of Liverpool. This article was originally published on The Conversation. Read the original article. Remember to contact your doctor or a healthcare professional if you suspect your child has contacted the virus. Have you ever gotten a disease from a pet? Share you story by emailing chatback@parent24.com and we may publish your comments. Please let us know if you wish to stay anonymous. Are dangerous dogs really dangerous?